BlackBerry has already confirmed the next smartphone to carry its brand name, the KEY2 will be unveiled on June 7. Although the Canadian company hasn't revealed anything regarding the phone's specs, the KEY2 was spotted a few times online, so we have an idea of what to expect from TCL Communication, the company manufacturing the smartphone. Today, BlackBerry made another interesting announcement concerning its upcoming KEY2 smartphone. 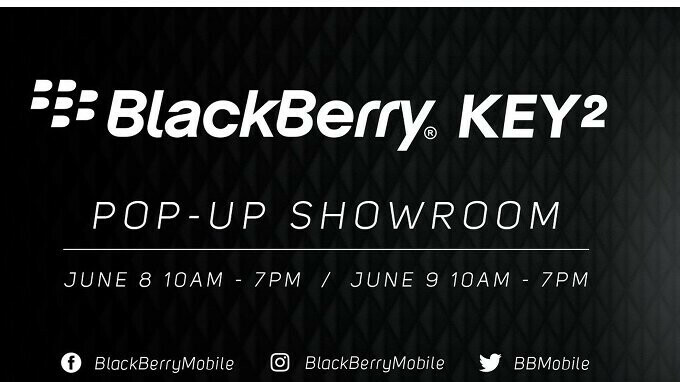 Apparently, the Canadian company plans to open a BlackBerry KEY2 pop-up showroom in NYC, which will run June 8-9. So, one day after the phone is officially introduced, consumers who want to be among the first in the world to experience the KEY2 will be able to check it out at this pop-up showroom that will be open for two days. We have no idea if BlackBerry KEY2 pop-up showrooms will be opened in other cities across the world, but the announcement suggests NYC will be the only place where the smartphone will be showcased. I think those who may have been on the fence with the 1st gen will go for this one with the improved innards and the (hopefully) improved dual cam setup. Even if battery life isn't as spectacular it will be worth it. It should still outperform just about every other phone's battery life regardless. "Apparently, the Canadian company plans to open a BlackBerry KEY2 pop-up showroom in NYC" I think that part of your article may be wrong Cosmin. No where in any of your source links does it mention that the "Canadian company" has plans to do anything. It mentions Blackberry Mobile, which means the pop up showroom will most likely be a TCL run affair. Mxy hijacked Cosmin's computer. He still thinks Waterloo is in charge of design, manufacture and sales of BlackBerry devices. I still don’t understand why it’s so hard for people to understand that BlackBerry does absolutely none of those things when it comes to smartphones. It’s BlackBerry Mobile/TCL that handles all of that. Some people even try to say it’s a “technicality” and because “BlackBerry Mobile” has the name “BlackBerry” in it, it means that they are BlackBerry the company, lol. Denying the truth doesn't make it go away. I'm not trying to speak for the two, but I don't think it's totally out of the realm of possibility. You act like blackberry has zero say in the process. Simply put, it's a technicality despite what some ignorant people think. LMAO! Except it’s not, and there is proof stating this from very beginning when they signed the deal. Just because you want to continue to live in ignorant denial about the facts doesn’t make the facts any less of being the facts. Saying the word fact 3 times in the same sentence isn't going to magically make your statement a fact. It's a technicality that you don't want to admit. Spamming the word “technicality” won’t make it so, no matter how much you wish it, especially when the FACTS prove that it’s not a technicality. You’re just choosing to remain ignorant of the facts. This is coming from the guy who continues to spam facts around over and over. Better facts than fabrication than fabrication like you like to spam. This will be of the best and most unique smartphones released in 2018. Definitely different from the pack in terms of design. Practically every other OEM is tripping over their own feet trying to make a smartphone that looks like every other smartphone out today. Eagerly awaiting the release of the KEY2. actually it will be a lame upgrade over last years keyone! How to make people hate this phone in an instant? Boom! It sports a notch! I don't see why. I don't think they sell enough to warrant a store front.